↑ 1.0 1.1 Diogenes of Sinope "The Zen of Disengagement: Diogene of Sinope". Voice in the Wilderness. Archived from the original on 2015-10-17. ↑ Laërtius & Hicks 1925, Ⅵ:79, Plutarch, Moralia, 717c. says that he died on the same day as Alexander the Great, which puts his death at 323 BC. Diogenes Laërtius's statement that Diogenes died "nearly 90" would put his year of birth at 412 BC. But Censorinus (De die natali, 15.2) says that he died at age 81, which puts his year of birth at 404 BC. The Suda puts his birth at the time of the Thirty Tyrants, which also gives 404 BC. 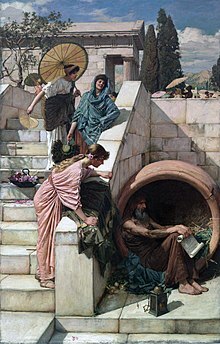 ↑ The original Greek word describing Diogenes' "jar" is pithos, a large jar for storing wine, grain, or olive oil. Modern variations include barrel, tub, vat, wine-vat, and kennel. Desmond, William (2008). Cynics. University of California Press. p. 21. ↑ John M. Dillon (2004). Morality and Custom in Ancient Greece. Indiana University Press. pp. 187–88. ISBN 978-0-253-34526-4.